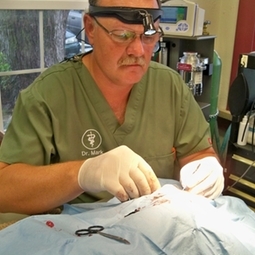 We are equipped for routine procedures such as: spay and neuter surgeries, soft tissue surgeries, basic orthopedic procedures, and emergency procedures. We also offer dental cleanings with our state of the art ultrasonic scaler and polisher. Our staff is highly-trained to deliver the safest, most advanced surgical techniques and support from pre-op to post-op. Prior to any surgery, we will perform a complete physical examination. We recommend pre-anesthetic blood work to ensure that we are aware of every aspect of your pet's health. Based on your pet's physical condition and procedure planned, we then create a personalized anesthetic plan. Throughout the procedure, our trained technicians monitor heart rate, breathing rate, blood oxygenation levels, and anesthetic depth. We monitor all pets after anesthesia to make sure they're warm and comfortable. Your pet's safety, health, and a quick recovery are our top priorities!